Situated right in the heart of Leicester Square, Napoleons Casino in London has everything you could possibly ask for when it comes to an evening entertainment - and then some. In 2013 this great casino celebrates 25 years in business and visitors can expect some great promotions and exciting gameplay throughout the year. Once you get inside the building you will be dazzled by how much of a Vegas-style this casino has. The red velvet carpet is countered by massive black tiles on the ceiling. On the wood panels on the walls just ties this all together and t feels like you are entering your favourite 1980's casino movie. The space between walls, machines and tables can be quite snug at times but that also means that you can jump from one game to another within a matter of minutes. If you are new to the world of gambling then there are few better places to start off. The staff at Napoleons is extremely helpful and you are urged to ask for help whenever you are unsure of what to do in a game. Napoleons on Leicester Square is a location packed with almost all your favourite casino games - offering you an excellent experience no matter what you are looking for. The casino has 12 different tables which accommodate a wide range of games. Players looking for some American Roulette can choose between six different tables depending on the stakes they want to play with. The lone blackjack table can accommodate bets from £5 all the way up to £2,000 - making it an excellent place to gamble. The casino has four tables for Punto Banco alone - something that makes it quite interesting in terms of the table distribution. The favourite game of James Bond is usually not this popular in UK casinos and this sets Napoleons apart from a lot of the competition. A casino would not be complete without a bunch of slot machines and this one offers 13 machines to play on along with a couple of machines for Touchbet roulette. The gambling floor itself is quite small compared to a lot of the more popular London casinos but it still does the trick for gamblers looking for a tight and friendly atmosphere. 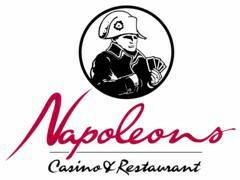 The restaurant at Napoleons Casino overlooks the casino floor offering a sophisticated dining experience in a relaxed atmosphere. Unlike a most other restaurants in the Napoleon brand - this one offers a wide variety of menus rather than just one, including Classic, Asian and Grill. The restaurant itself holds its own on the London scene and people can come here just for a bite to eat rather than the gambling experience. So if you are looking for a full night out with food and your favourite casino game then the combination at this casino is almost unmatched in London. There is also a bar at the casino but this is more tucked away and does not play such a big role in the overall experience. You can drink anything from cocktails to fine wines when you gamble or eat - just order at the bar when you have time or ask anyone of the people working on the casino floor. One of the main attractions of this casino is the evening Mahjong event that is free for members of the casino. The event runs from 12 noon all the way to 5 pm, giving you a chance to win a bit of money and practice your Mahjong skills. Other than this the casino does not offer very many tournaments and a lot of focus is on offering free food or snacks on certain days. There is everything from Dim Sum Sundays to a complimentary Thai Buffet or a complimentary Chinese Buffet Breakfast. Entry is free to all over the age of 18 if you are able to show identification on your first visit. Some payouts will also require you to show I.D., mainly whose over £1,000. Membership gives players unlimited gambling facilities, use of all Cash Desk facilities including debit, cheque and foreign currency transactions, a New Members Welcome Pack which includes, vouchers, discounts and offers as well as free entry into prize draws. The casino is open 24 hours a day - 7 days a week. The restaurant is open from 5:30pm while the bar opens from 1:00 pm to 4:00 am. This is a casino with a very homely feeling - where the staff go out of their way to make you feel like you're at home. The variety of games is quite good even though there is a lack of Blackjack tables (with just one on offer). Food is a big part of this casino and the complimentary meals and buffets really do lift the overall impression of the establishment. Events might not be something that they put a massive emphasis on but the daily Mahjong freeroll is a really nice touch if you are in to those kinds of games. Membership is very easy to acquire and once you get in the door of this casino it will be hard for you to leave as it is very close to a brilliant London casino experience. With the opening hours being around the clock you can drop in whenever you want for a hand or two.